Taken today with the ridiculously lo-fi (and super fun to shoot!) Olympus OM-G. It is a bit crazy how good this combo is exposure-wise. f/2.8 @ 1/60s, on PanF+. The trick, I believe, is to underexpose slightly and pull the whole thing back slightly in post…which wasn’t really necessary here. 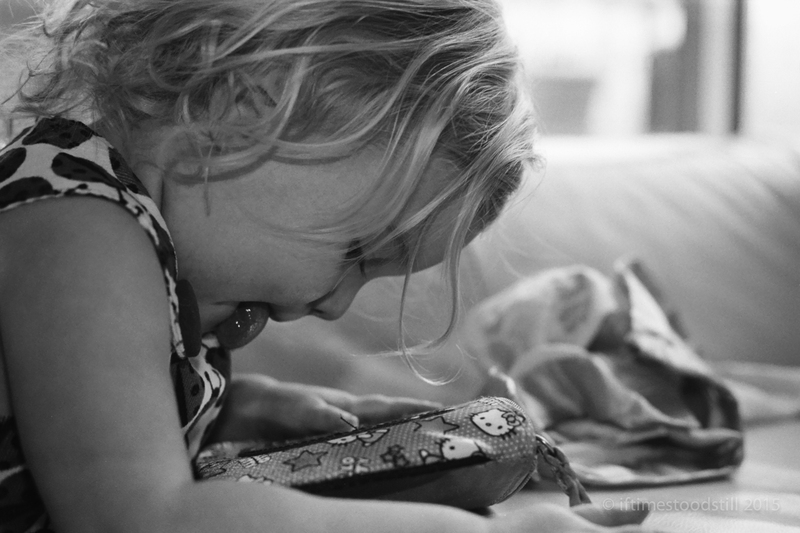 Once again, proof that b&w film handles flash really well. BTW when I viewed the image in full size, I noticed some mild posterization in the lighter area, that being of Baby J’s cheek and the area around her ear. My monitor is fairly good so I don’t think it’s that. It could be the JPEG compression, too. Ahhhhh Karim D. Ghantous…you sly dog you!!! You have single-handedly happened upon (well, I was already aware of it, but was hoping no one else would notice…) the one and only flaw of the Pakon system! For some reason, B&W/Grayscale scanning seems to somehow revert to 8 bit architecture. I believe it must have been a flaw in how the B&W patch was later applied (these things were not originally built scanning B&W film…it was a later addition). As a result (as I have stated before…) these are simply not archival-quality scans. You want a high-res print, ya gotta go elsewhere! I’ll keep you posted if I manage a fix. I have to ask: is it practical to scan b&w negs as colour negs? Do you mean in order to apply dust & scratch reduction (which I’m sure you know won’t work because of the silver in the film…) or in order to obtain better gradients? Just to obtain better gradients, I mean. See how it goes.